Picket fences are an affordable decorative fence and have a reasonably quick installation procedure. A Picket fence is made up of three main components, posts, pickets and rails. Picket fences can be installed using timber posts or masonry (eg; brick, stone, render) posts. Picket fences can also be installed on level or sloping surfaces, and can incorporate pedestrian and driveway gates. Pickets come in various shapes and sizes (see illustrations) and can be fixed in level or shaped designs. 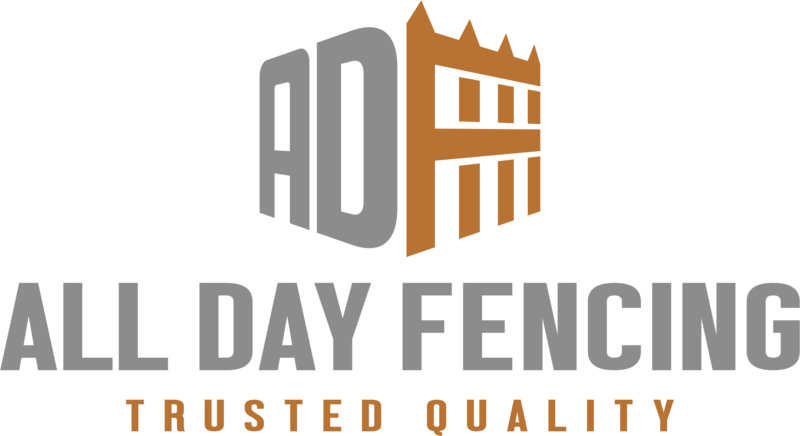 All Day Fencingcan supply and install standard or custom made picket designs with either timber or masonry posts. If your site is not level, the picket fence should be stepped in even lengths. Before you can calculate the cost of your picket fence you will need to know how many posts your fence will require. Timber fence posts can be spaced evenly, between 1.5m and 2.7m, depending on how many steps your fence may contain. The steeper a site, the more posts will be required. An extra post is required beside all gates and openings, plus one extra post is required for the end post. Picket fence prices are shown by the metre for the picket panels, ( which includes pickets and rails), and separately for the posts. When calculating the length of the timber posts, an extra 600mm should be allowed in-ground. If your picket fence is stepped due to a sloping site, the height of each step also has to be added to the length of the post. For example, the height for a 1.2m fence which steps up 200mm each post will be 2 metres. Timber posts are available in 300mm lengths starting from 1.2 metres, (eg; 1.2, 1.5, 1.8, 2.1, 2.4, 2.7, 3.0, 3.3, 3.6 etc). Therefore the length of the posts required will be 2.1 metres. Pickets can be arranged in pattens called bay designs. 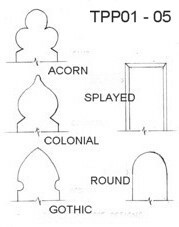 Some common designs are shown above. Many picket fences are installed between decorative brick or stone fence posts. All Day Fencing design and build brick and stone fence piers and can supply and install cement and reconstituted sandstone columns in both fence and pergola designs, (refer to the section on masonry fencing/brick piers). If you are designing a carport, deck or pergola, look at our great range of sandstone columns and products.